Written by Dave Hill, for The Guardian London Blog, 6 September 2011. Photograph: Dave Hill. “Here’s how the “something extra” that Boris Johnson and Tessa Jowell required for the Olympic Park looked when I pointed my camera at it yesterday afternoon. No, those yellow cranes aren’t part of it. Yes, those weird clouds are real. 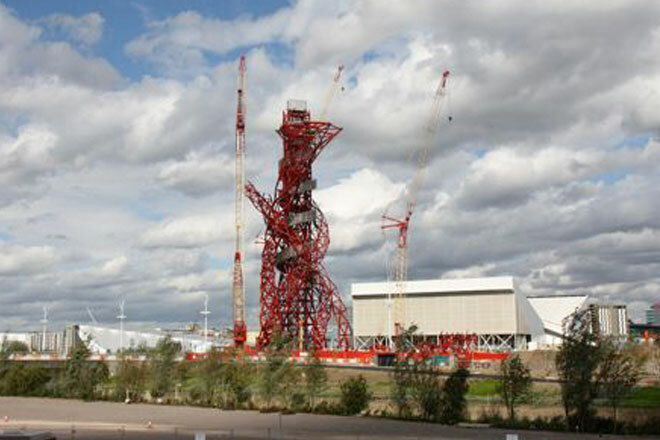 The Olympic stadium stands to the left of the ArcelorMittal Orbit observation tower from this angle, just out of shot. Also just out of shot were two groups of mostly grey-haired Olympic Park tourists. Out-of-towners, I’d say, judging by their accents and attire. They too were taking photos, and being regaled with key facts and choice anecdotes. Did I really hear a guide say, “They actually found a fox’s den, 14 floors up!” while pointing south to the former location of whatever building it was that no longer exists. There was a small chorus of astonished exhalations. The view from the Greenway has long crystalised the spectrum of Olympic possibilities. Standing there fills me simultaneously with wonder at the scale of the regeneration idealism at work and with foreboding at the potential for the whole thing to become one vast, historic symbol of the folly of grand projets. The Orbit, as it embeds itself, still sprouting, in the Games landscape, distills these hopes and fears, well, monumentally. Its purpose is to provide epic views and to intrigue – two ways in which to draw a crowd to the East End “in legacy.” It’s also a symbol of the whims and egos of the powerful, should you wish to look at it that way. First drafts of its history tell of a chance meeting of less than a minute between Boris Johnson and Lakshmi Mittal, Britain’s wealthiest man, at the world economic forum in Davos in early 2009. Mittal said he’d supply the metalwork. Boris said thanks very much. His foes might decry this as typical of the way the Tory Mayor operates, never missing the chance to grab public glory for himself and schmoozing filthy private wealth – Barclays sponsoring “Boris bikes” would be cited as a further example. His admirers would see only spontaneous brilliance in the cause of grand philanthropy (ArcelorMittal gave £16 million). They might also point out that the Anish Kapoor creation has had public funding too (£3.1 million from the London Development Agency) and was only commissioned following a competition, judged by eminent art experts including one of Boris’s unpaid “fund-raising champions” Anita Zabludowicz. To this, Boris-bashers might respond that the prize money was reportedly boosted to the tune of £80,000 by property man Pierre Rolin, the then partner of another of those champions, the art consultant Helen Macintyre. Judging by a subsequent interview, Rolin might be forgiven for taking a somewhat rueful hindsight view of his own generosity.